Following a disappointing run in the Group 1 PA Qatar Cup-Prix Dragon in September, Al Mourtajez (Dahess x Arwa by Nuits St Georges) showed on Sunday, 4th of October at the Longchamp racecourse that last time was really just a glitch. 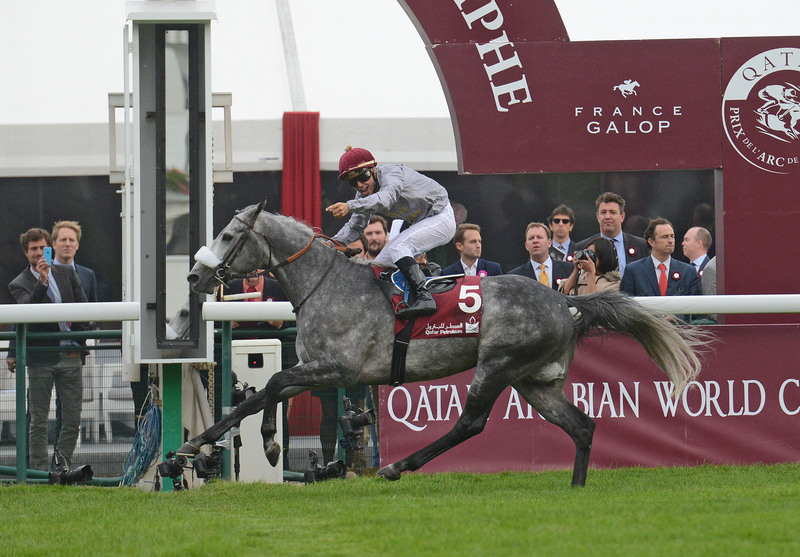 In fact, that Sunday, he won the Group 1 PA Qatar Arabian World Cup, which ends the French season, by five lengths. This was a first victory at Longchamp with a Purebred Arabian for trainer Thomas Fourcy and a first victory for Al Shaqab Racing in the Qatar Arabian World Cup. 19 runners had lined up at the start of the 2000 meter race, which was worth 1 Million Euros. Several of the runners had already won Group 1 PA races, including Djainka des Forges (Kerbella x Djamour des Forges by Tidjani), who was trying to defend her title. There was a lot of pressure on Sir Bani Yas (mer x Nassem El Baher by Elios de Carrere), winner of the Group 1 PA Qatar International Stakes, the first leg of the Doha Triple Crown, that was run on the 1st August 2015 at Goodwood. However, Sir Bani Yas, trained by Elisabeth Bernard and ridden by Jean-Bernard Eyquem, could never threaten the Julien Augé partnered Al Mourtajez, who just took off in the final furlong. Sir Bani Yas in the end finished third, which means that he cannot win 1 Million US Dollar bonus put in place for the horse that wins the three legs of the Doha Triple Crown (Goodwood, Longchamp, Emir’s Sword 2016). This year, the Doha Triple Crown will not be won.